The Royal Enfield products normally show the personality of the owner with the established cult among the bullet riders. The Bullet Standard -350 is another product that really strengthens the fame and fidelity among the votaries of this manufacturer. The sound of the bike has the magnetic characteristic and this brings in a prominent figure among the two-wheelers in India. STD- 350 has the commanding thumping sound which no other bike can match in this region. The chopper sound of STD and its burly look hold the die-hards breathless. It has a long wheelbase and the bigger tyres offer a safe and secure journey making it a model for the long distance travel. The STD-350 comes with several features such as all cast-iron engine, full mudguards and traditional foot gear design with correct gear shift and a neutral finder to make the shifting to neutral easier. Bullet STD-350 comes with air-cooled, 4-stroke engine with a displacement of 346 cc. The engine has a support for single cylinder. 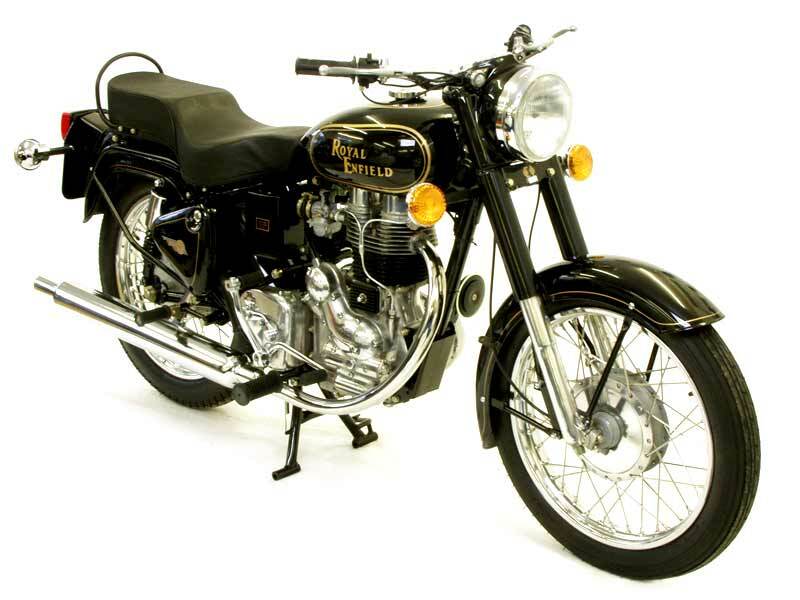 Bullet 350 develops 18 bhp of peak power at 5000 rpm and generates a torque of 32 Nm at 3000 rpm. It has 4-speed right foot gear shift type transmission. 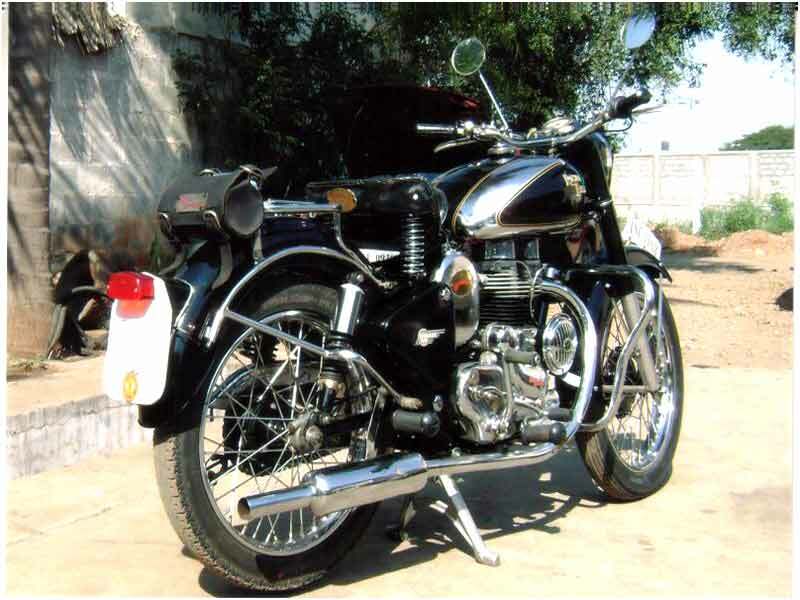 In terms of looks, Bullet Standard -350 retains the pristine old look. The length and width of STD 350 are 2120mm, 750mm respectively. It has a proportionate performance-weight ratio. It has ground clearance of 140mm. The front suspensions in Bullet 350 include telescopic hydraulic damping155mm travel suspensions and the rear suspension includes 130 mm travel gas filled shock absorbers with swing arm. Bullet 350 has drum brake in the front and same type in the rear. The design and look of the bike renders a big ego satisfaction and commands respect in society. Bullet STD offers great comfort and safety features, apart from the macho looks it possesses, making it one of the best bikes in its class and segment. The ride, stability, pick up, handling are all perfect in Bullet 350 with some 50 year old basic design. It is considered as one of the safest powerful bikes in India and it has solid weight, large wheelbase and big tyre. To ride this bike will give a lasting experience and will long to own for oneself. This is the bike that suits for the open road where we can shoot out with the unique thudding sounds. However this bike is hard to handle in the heavy traffic. It gives about 35 kmpl and comes in affordable price. Although many people complain bullet is a pain to start, unreliable, heavy and tiresome, everything depends on the service and treatment. If we give for servicing regularly it would perform as any other bike with more pleasure and delight. However Bullet 350 is apparently having the problem with the emission norm and hence Royal Enfield is likely to discontinue this bike or they may come up with the better UCE-350 engine. 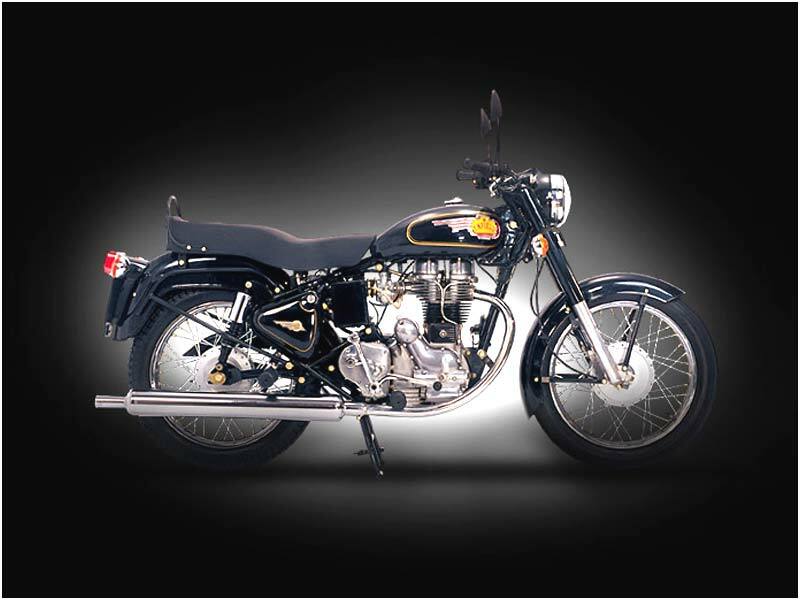 Bullet Standard 350, a synonym of classic style and promises for royal ride as it delivers splendid mileage ranging from 40-45 kmpl. Bullet 350 is available only in Black color. Front Suspension Telescopic With Hydraulic Damping, Stroke 130mm.